I thank you for your continued support and look forward to helping you find the right property for your needs or to help sell your property by displaying it here. 25 Years of Friendly and Family Style Service. I have lived in the Kennisis Lake/Redstone Lake area for 45 years. We raised our family on Kennisis Lake and later moved over to Redstone Lake. This area is known for the clarity of the lakes. Haliburton Forest and Wildlife is in our backyard so to speak. The Wolf Center is a great place to take your guests on a raining afternoon. Stop for a meal at the Haliburton Forest Cookhouse. In the winter book a dog sled tour through the forest of Haliburton Forest and Wildlife. Snowmobiling is popular in the winter with groomed trails throughout Haliburton County and access across the province. Our office may be in Kennisis Lake and Redstone Lake Area, but we service all of Haliburton County from Kennisis Lake, Redstone Lake, Haliburton Lake, Drag and Eagle Lake where Sir Sam’s Ski Resort is. Over to the Wilberforce, Bancroft area across to Norland up to Minden, up Hwy 35 to Dorset. also, over Hwy 118 to Hwy 11 towards Bracebridge The Kennisis /Redstone Lakes are at the top of the Trent waterway system and our waters continually are changing as the fresh spring water enters the lake. This change helps to keep the LAKES PRISTINE. Our waters make their way out through many lakes some of which are Red Pine, Big Hawk, Little Brother, Big Brother, St Nora’s, Halls Lake, Kushog Lake, Boshkung Lake. Water from Redstone finds its way here also through Little Redstone, Big Redstone, Eagle Lake, Cranberry into 3 lake chain Pine, Green, Maple Lake. Maple waters go to Beech Lake which flows to Boshkung. Theses waters travel through Twelve Mile, Mountain, Horseshoe, Minden Lake and into Gull Lake. Bob and Little Bob feed in here also. These waters travel on through Moore Lake, Shadow Lake, Silver and into Gull River then into Balsam Lake onto Cameron Lake, Sturgeon Lake, Buckhorn, Lower Buckhorn, Lovesick Lake to Stoney Lake, Clear Lake to Kachewanooka and eventually ending up in Rice Lake. From there into the Trent River and several other small tributaries join the river between Crowe Bay and Trenton where the mouth of the Trent River enters the Bay of Quinte. Quite a journey for our waters. The water from Drag Lake goes to Emmerson Pond into a 5 chain boating lake system- Head Lake at Haliburton, to Grass Lake, Soyers Lake, Kashagawigamog and Canning Lake. This water goes to the Burnt River water shed. The other water shed starts at Miskwabi into, Blue Hawk Lk, Long Lake into Drag river to Burnt river to Cameron River. Koshlong lake also to the Drag river. Other lakes to east of Haliburton are picked up in smaller sheds. Farquhar, Grace, Percy, Esson Little Glamor, Big Glamor, Gooderham Lake. Salerno Lake, White Lake, Contau, Crystal Lake, Catchacoma, Mississauga Lake, Anstruther Lake Eels, and Jack Lake all end up in the Kawartha Lakes region then into Rice Lake etc. Gloria and her husband Jim owned and operated both Backwoods Marina-Kennisis Lake and Jim Carnochan Contracting (building cottages, installing septics, excavation etc) prior to becoming a Real Estate representative. These businesses gave Gloria a valuable understanding of the various aspects of having a cottage. Gloria is very knowledgeable of the Haliburton Highlands as it has been home for 45 years. The first step in choosing the right agent is pick someone who knows the area. 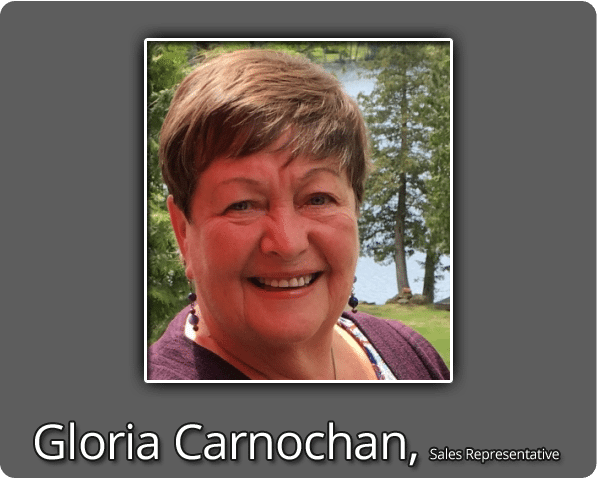 Experience in the business is the second – and Gloria has both experience and knowledge – now throw in one hard working agent and you have the perfect formula for success when buying or selling your home or cottage.